We are committed to doing our part to prevent and detect fraud and abuse. 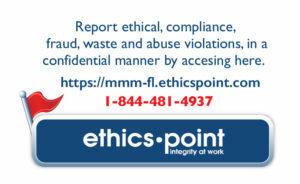 MMM of Florida’s goal is to behave ethically and with integrity as a leader in the healthcare industry. We work to identify and respond to fraud and other misconduct by third parties that may affect government programs. Fraud – Is a false representation or scam to obtain unauthorized benefit or wrongly profit. Waste – Occurs when someone incurs in unnecessary, extravagant or negligent costs, or resources are poorly managed. Abuse – Occurs when a provider is inconsistent with good practices in medicine or business. It results in a cost, or in reimbursements for services that are not medically necessary or do not comply with the professional and ethical standards of the health industry. Billing of Non-Rendered Services – It may include billing for services not performed, billing for a higher level of services than the ones performed, billing using inflated procedure codes and overstating patient diagnoses. Alterations in claim forms and clinical records. Billing of providers excluded from participation in federal programs. Prescription alterations (such as the type of drugs and quantities). Anti-Kickback – When remuneration is solicited, received or paid in exchange for referrals to provide services that are reimbursable by the federal government. Stark Law – A provider refers a Medicare enrollee to receive some services in a business in which he/she or a family member has financial interests. Beneficiary Inducement Law – Remuneration is offered to influence a beneficiary in choosing a particular provider or supplier. Beneficiary Prescription Abuse – A patient obtains controlled substances by stating a false medical condition. Typically, patients will visit multiple physicians with the same complaint to obtain multiple prescriptions and fill those prescriptions at multiple pharmacies. This allows the patient to illegally obtain narcotics or other controlled substances for personal use or sale. Conflict of Interest – An employee, manager, or executive has an undisclosed economic or personal interest in a transaction. For example, an employee steers a contract to a company the employee or a family member owns, without disclosing the relationship. If you are aware of any activity similar to the ones mentioned above, or are not sure if an activity is fraud or abuse, please contact us. We will investigate! You can also make your report anonymously! All information received is treated as confidential, and the results of the investigations will be addressed only by people that have legitimate motives to receive the information (for example, local and federal authorities, and MMM of Florida Directors). In order to do so, please click on the image below.